In your notes on app-store you say: “Missed a drink? You can also set the date / time of when you want your caffeine/hydration entered.” -How is this done? Under “Edit” I cant find any place where I can edit or modify the date/time. I forgot to add all coffees yesterday – how can I add this? I’m using iPhone XS. Hello! Let me clarify, the current version of Caffiend does not have an editing function in the Journal where you are talking about. That feature is coming in the next update though. 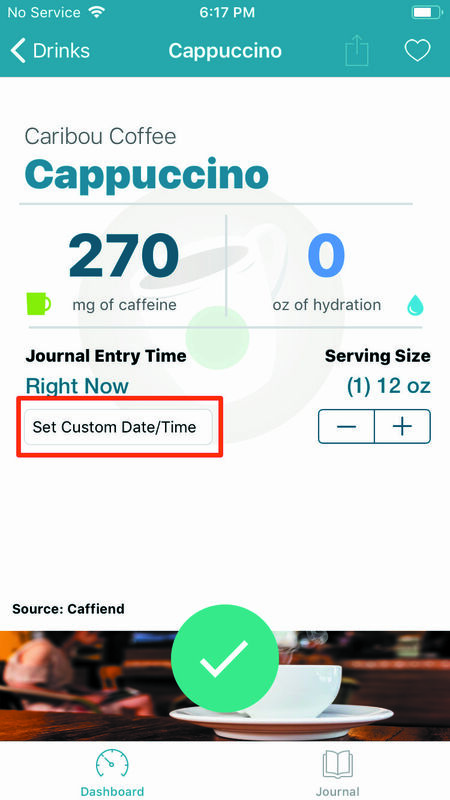 Here is how to achieve what you want in Caffiend as of today – add a drink like normal, but before you tap the add button tap “Set Custom Date/Time”. This will let you choose a past or future day and time for your drink, and it will be added to the journal accordingly. Let me know if that works for you. Thanks for downloading Caffiend!